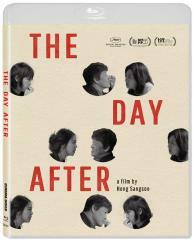 South Korean Master Hong Sangsoo s 21st feature as director, The Day After, is a mordantly comic tale of infidelity and mistaken identity. Book publisher Bongwan s (Kwon Haehyo) marriage is on the rocks after his wife (Cho Yunhee) discovers the affair he s been having with his assistant (Kim Saebyuk). Now that relationship is ending too and Bongwan s new assistant, the sharp and sensitive Areum (Kim Minhee), on her first day in the office, is left to navigate the fallout of all the turnover in Bongwan s life. With its ingeniously destabilizing leaps through time and stark black and white cinematography, The Day After begins as a darkly hilarious story of a man embroiled in extramarital entanglements but soon shifts in a way only Hong can manage into a heartfelt portrayal of a young woman on a quest for spiritual fulfillment.